After the release of a trending motion poster of Shamanthakamani and the character of Nara rohith, the production house has now revealed the look of its second lead character of the movie. 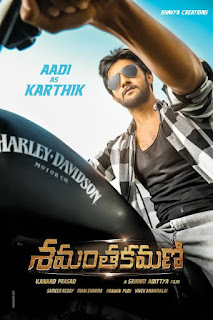 Here is Aadi Saikumar as Karthik. The character not just looks classic but dynamic as well. The team has not given out any other information with regards to the poster and have left it to the audience's imagination. The director has given a very eccentric look for the promotion and the characterisation of the movie. Can't wait to check out what's next.